Behind every good outfit is a great bag. Get the one they’ll want to keep! Versatility and style? Yes! Our eco-chic hunting bag combines resilient material with a slim design that’ll suit tree huggers and city slickers alike. This bag is made of 3 mm industrial felt and fastened with thread stitching. The cool neutrals plus a hint of bold color on this cross-body bag evokes a So Cal desert vibe we just can’t get enough of. 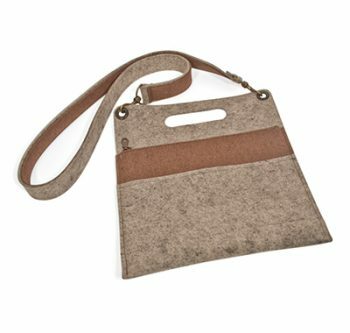 This bag is made from one of the most unique and versatile materials available: wool felt. Felt is made by a process involving heat, moisture, and pressing in which natural or a blend of natural and synthetic fibers entangle and interlock to form a dense, resilient textile. The result is an incredibly durable yet soft fabric. 100% natural felt is also known for its insulation, its water-resistant abilities, and its environmental sustainability. Felt can stand up to all kinds of weather, while retaining its shape and durability for decades. This means you can enjoy your hunting bag for years to come. Our hunting bag features a removable shoulder strap and die-cut handle for convenient carrying. Two pouches include one zippered pouch to protect your wallet and other valuables. The natural gray and brown accents lend a timeless look that complements any outfit. This bag can be spot cleaned using cold water.